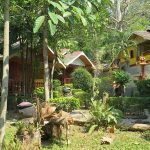 Situated down by the ocean in one of Koh Chang’s most relaxed villages, this small long running seafront resort is now available for immediate sale. The resort has 21 a/c bungalows, all with ensuite bathrooms, laid out around a pretty lawned garden with a plunge pool at its center. Behind the pool is a raised restaurant area which can seat 40, ideal for barbecues and parties. There is a additional two storey thatch roofed wooden restaurant and reception building at the entrance to the resort, as well as off-street parking for both car and motorbikes. Within the resort land itself, there is also room for expansion if desired. The seafront resort is available on a long lease of up to 15 years, with the annual rent comparing very favourably with other surrounding businesses. Financing deals are possible with the purchase. Electricity is government installed 3 phase. Water is guaranteed throughout the year from well and mountain sources. The village beach is just 5 minutes walk away along the rocks at the front of the property.